Chair Massage is a wonderful way to show your employees you care about them. $75 per hour, per therapist. plus tax. 2 hour minimum. Travel fee is $2 per mile from our office, per therapist. A 50% non-refundable deposit is due upon scheduling. 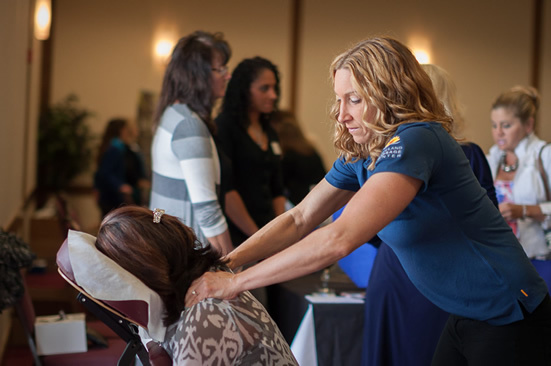 As part of our corporate wellness initiatives, our company invited Loveland Massage Center to our Wellness Fair to give our employees chair massages. Amanda and Mandy were the hit of the fair! We were very pleased with their professional approach and natural kindness. They are very skilled at what they do and our employees felt like they got a world class treatment. Their rates are very reasonable and we look forward to having them visit us again. Thank you both for the wonderful experience! We provide the therapists, massage tables and/or chairs, music, aromatherapy, sign-up sheets, coupons/promotional materials, sanitizing supplies, etc. We will ALWAYS arrive 20-30 minutes prior to start time. We can provide your company with a sign up sheet in advance to help get your employees scheduled in a timely manner to avoid as much down time as possible. Contact us now to book your chair massage.